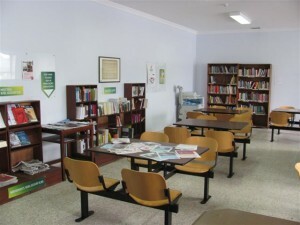 Located in Ponte de Lima, was named Alberto Caeiro Library (BAC) in August 2012. It offers open access to shelves and is organized according to the Universal Decimal Classification (UDC). Serves the UFP academic community, as well as any interested user. Its collection consists of books, periodicals, academic works, audiovisual materials and reference works about the areas of science and knowledge, organization, information, documentation, philosophy, psychology, religion, social sciences, statistics, politics, economy , business, law, public administration, social work, education, mathematics, natural sciences, applied sciences, medicine, technology, art, recreation, entertainment, sports, language, linguistics, literature, geography, biography and history. This library has a reading room with seating for 28 people, is equipped for printing, copying and scanning in self-service and has wireless connection.